After seeing this scarf on at least six other bloggers in the last few weeks (although I really did see Jessica rocking it first, followed by 10 instagrams from other bloggers in the coming weeks), I feel like it should be on Sh*t Bloggers Wear, officially. Honestly, though, I picked it up because I love things that can double as blankets (no, seriously, wait til you see the other one I got the same day! Perfect for the plane home next week) and I'm also a fan of the mohair/plaid trend this season, so sue me for making you look at the same scarf one more time. Anyways, scarf stories aside, I've also been living in these Schutz boots I picked up on Black Friday (as mentioned in yesterday's post, I'm all about gifts for myself). 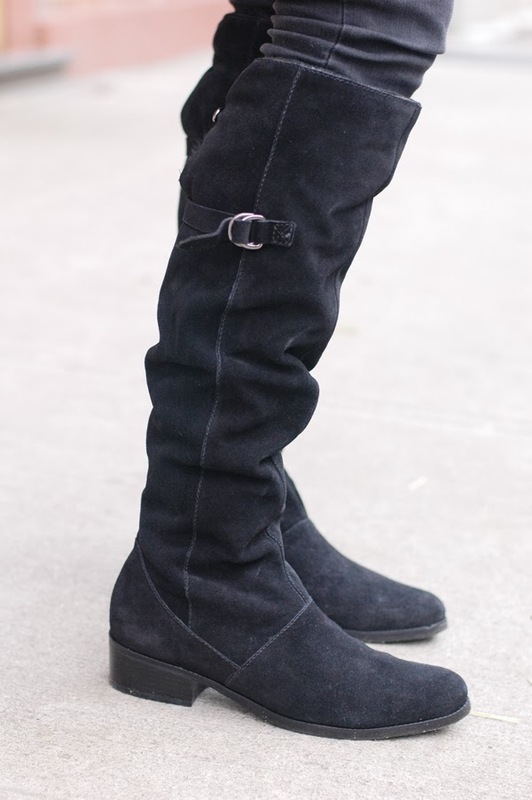 Tall, black, flat and lined with faux-fur, they'll be getting me through this winter one cold, snowy day at a time—including the 12 I'm about to spend in even colder, snowier Iowa! You are charming in all the clothing styles, and why ever of pants or leather skirt? It is so much trendy at the moment and i think that that will be very well to you. That's such a gorgeous outfit! And you're so pretty! I don't even care that I've seen this scarf everywhere, I still want it! It's so cozy looking, and the plaid is perfect! I'm not tired of seeing this scarf yet & am kicking myself for not picking it up! Love how you styled it! I feel the same about blanket scarves, perfect for chilly offices & frigid planes!